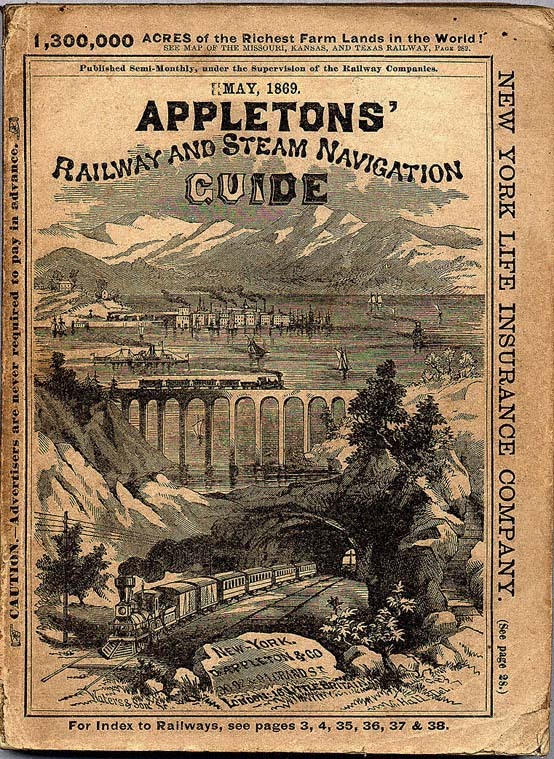 "Appletons' Railway and Steam Navigation Guide"
During the two decades from 1840 to 1860 the nascent U.S. railroad system saw considerable growth East of the Mississippi in both numbers of new lines and of communities served. As this expansion flourished two types of new publications for rail travelers – "travel" guides and "railway" guides – also began to appear. Both types of guidebooks grew quickly in popularity as the new railroads made travel increasingly more accessible and affordable to the general public. As they do today, the new travel guides provided illustrations and descriptions of the communities, countryside, economy, accommodations, and other points of interest along the routes of the railroads. 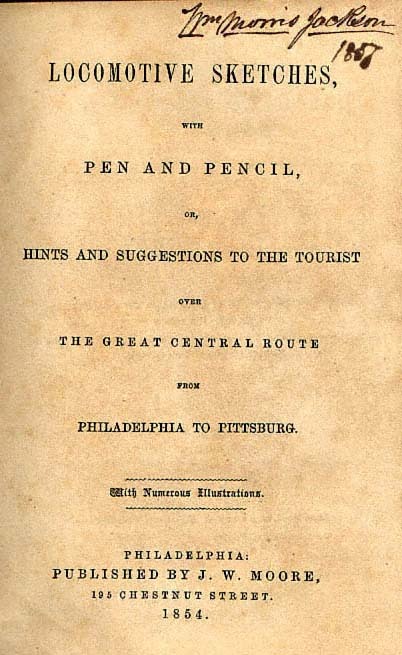 The introduction to one such early (1854) guide for travelers over the Pennsylvania Railroad from Philadelphia to Pittsburgh, "Locomotive Sketches with Pen and Pencil," states their purpose well. "Locomotive Sketches with Pen and Pencil"
"IN all parts of Europe the traveler is supplied with Guide-books, detailing, for his special information and satisfaction, the leading features of all objects of interest on his route. There is not an antiquated castle, a battle-field, a mountain, or a river, but has its peculiar points revealed for the entertainment of the stranger, as he rambles along from place to place. No doubt this materially adds to the interest and subsequent value of travel; and probably constitutes one of the paramount attractions of a tour in Europe, since all its incidents are thus permanently impressed on the mind. "In the United States no such conveniences exist; and this is probably one reason why foreigners generally misunderstand and misrepresent us — they are not sufficiently informed to give a correct estimate of our resources, peculiarities, and institutions. They hastily pass over our railways and rivers, and, for the want of suitable printed-guides, return as profoundly ignorant of the routes traversed as they were at the starting point — for seeing is not understanding. "In her physical aspect and resources, Pennsylvania is pre-eminently the most interesting State in the Union—yet, for the want of popular descriptions and references, her real character is comparatively obscured from the public view. The most intelligent individual may make the tour from the Delaware to the Ohio by railroad, and yet be unable to identify one-half the towns, or mountains, or streams, or otherwise explain correctly the prominent local characteristics of the route traversed. Thousands of persons, of fortune and leisure, owing to this evil, are intimidated from traveling; while many proceed direct to Europe, before visiting the objects of interest in their own immediate land. "It was as much with the hope of converting our time to a useful purpose, as receiving a reasonable compensation for it, that we undertook to sketch, in a sprightly and popular way, some of the prominent features of our time-honoured Commonwealth. If we have collected together in tolerable order, a mass of matter that will relieve, to some extent the fatigue and monotony of travel, our main object has been attained. "We may add, that over seventeen hundred dollars have been expended for pictorial illustrations, some of which we can point to as fair specimens of the art. During the particular time we were engaged in the preparation of these pages, however, an unusual activity prevailed among our best wood engravers, in consequence of large orders from the Government. We were, therefore, in several instances, forced to employ artists of ordinary talent—though, upon the whole, we think the reader will find little to complain of under this head. "The matter is, what it purports to be, off-hand, and no particular credit is claimed or expected for it. We have profited from the works of others to a greater extent than we should, had our time been less limited.. Our acknowledgments are due to the works of the late Prof. Richardson, and to those of Mr. Day, Mr. Trego, and others, from which the matter not strictly original has been mainly extracted. With these explanations our work is done." from "Locomotive Sketches with Pen and Pencil"
Along with the completion of the Pacific Railroad in 1869 establishing significant rail service West of the Mississippi for the first time also came two of the most famous and enduring railroad travel guides of all times — "The Pacific Tourist: Adams & Bishop's Illustrated Transcontinental Guide of Travel from the Atlantic to the Pacific" and "Crofutt's New Overland Tourist and Pacific Coast Guide." Many editions of each of these two remarkable volumes were published and sold throughout the United States and along the railroads over the next three decades. Both of these guides were profusely illustrated and contained hundreds of pages of detailed information about every aspect of making a transcontinental trip by rail. While modern reprints are available, fortunately many original copies also still survive. Acquiring one of these not only provides the reader with a wonderfully detailed inside view of the Pacific Railroad, but also represents a prized — and affordable — piece of railroad history for any serious collector. Crofutt's "Great Trans-Continental Tourist Guide," 1870. 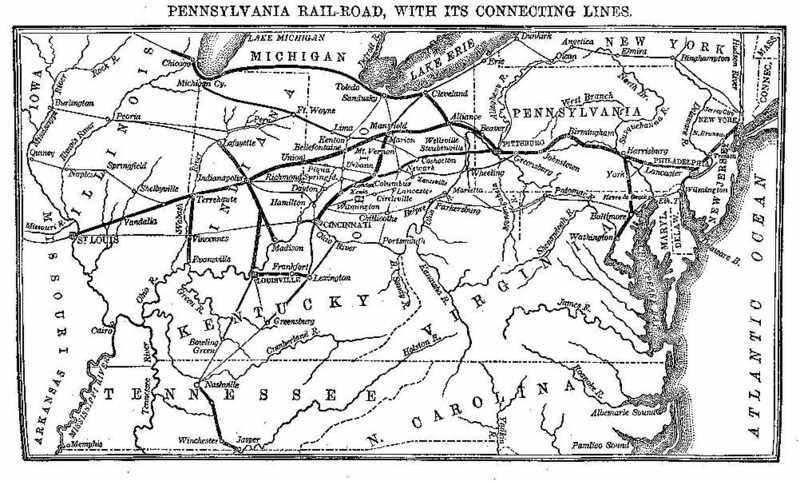 The "railway" guide first appeared as early as 1846 ("Disturnell's Railroad, Steamboat and Telegraph Guide") and featured time tables, maps, station and agent lists, and much other railroad company information which was designed to help travelers understand the logistics of using the nation's increasingly complex new system of rail transportation. While rail travel was in general faster and/or easier than by horse, stage, river or ship, planning and actually completing such a trip was still frequently no simple task. Doubtless one reason for this was that a journey by rail often required making connections between trains of more than one railroad. As the development of the concept of the "Union" station (at which most if not all the rail lines serving a community used the same terminal) was still decades in the future, each interline connection usually also required travel to another, sometimes distant, depot. Another complication affecting scheduled train travel in this era was the fact that local time in each community was established locally. This often made the accurate following of time tables and making connections by travelers, and the scheduling of trains by the railroads, exceeding complicated. The railroads finally established standard time for their operations in 1883, but its local adoption by the public at large was slow to follow. (Standard Time Zones based on those first established by the railroads were not, in fact, finally established by Federal law until 1918.) 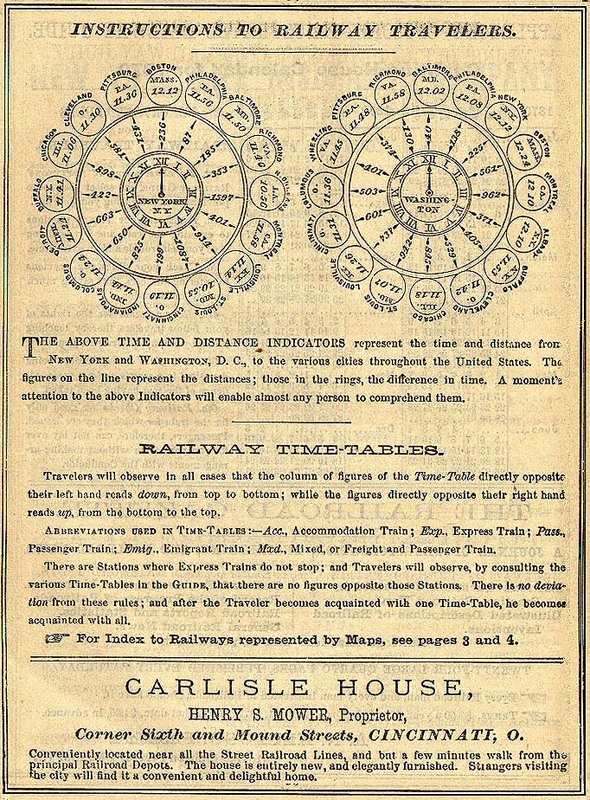 For travelers to fully understand and use railway time tables effectively prior to 1883, therefore, required reference to a chart such as the one illustrated below from "Appletons' Railway and Steam Navigation Guide." "The question of uniform time standards for railways of the United States has long attracted the attention of railway managers, but Mr. W. F. Allen, editor of the Traveler's Official Guide, and secretary of the time conventions, is entitled to the credit of having perfected the admirable system which was adopted by the General Time Convention of Railway Managers, held at Chicago, October 11, 1883, and ratified by the Southern Railway Time Convention, held at New York, October 17, 1883. As this is a subject of great interest to the entire country, a brief synopsis of the general principles governing the proposed plan is deemed appropriate in this report. "Under the present system each railway is operated independently on the local time of some principal point or points on said road, but this plan was found to be highly objectionable, owing to the fact that some fifty standards, intersecting and interlacing each other, were in use throughout the country. By the plan which has been adopted this number will be reduced to four, the difference in time being one hour between each, viz, the 75th, 90th, 105th, and 120th degrees of longitude west from Greenwich. The adoption of these standards will not cause a difference of more than thirty minutes from the local time at any point which is now used as a standard. "The new arrangement goes into effect November 18, 1883, and all changes of time are to occur at the termini of roads, or at the ends of divisions. The seventy-fifth meridian being almost precisely the central meridian for the system of roads now using standards based upon the time of the Eastern cities, and the ninetieth meridian being equally central for roads now running by the time of Western cities, the time of these meridians has been adopted for the territory which includes 90 per cent. of the whole railway system of the country. Nearly all of the larger cities have abolished local time and adopted that of the nearest standard meridian in use by the railways." 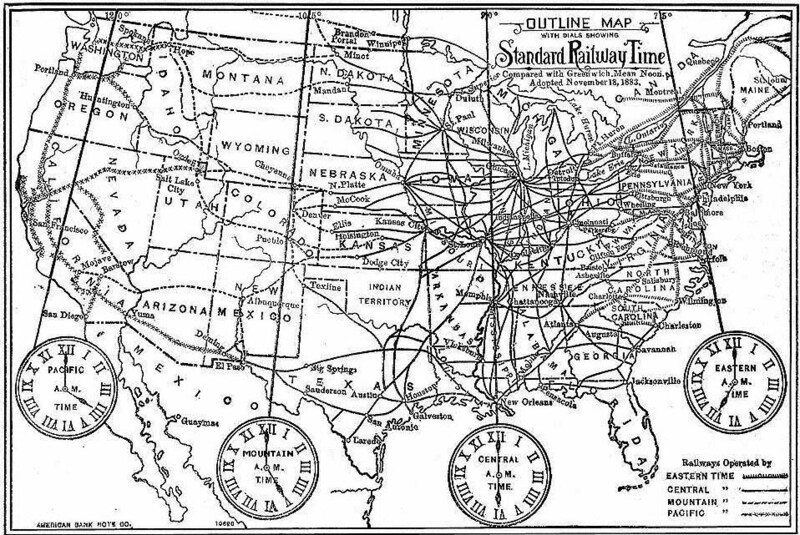 For many years the following map appeared in each monthly issue of the "Travelers" the full name of which had also grown along with the railroads to "Travelers' Official Guide of the Railway and Steam Navigation Lines of the United States and Canada." "STANDARD RAILWAY TIME" adopted November 18, 1883. Two years after "Disturnell's" first appeared two more guides were launched in 1848 — "Doggett's Railroad Guide and Gazetteer" and "Appletons' Railway and Steam Navigation Guide" — followed by "Dinsmore's (later Batterman's) American Railway Guide" in 1850, "Lloyd's American Guide" in 1857, "Travelers' Official Railway Guide" in 1868, and "The Rand-McNally Official Railway Guide and Handbook" in 1871 among others. 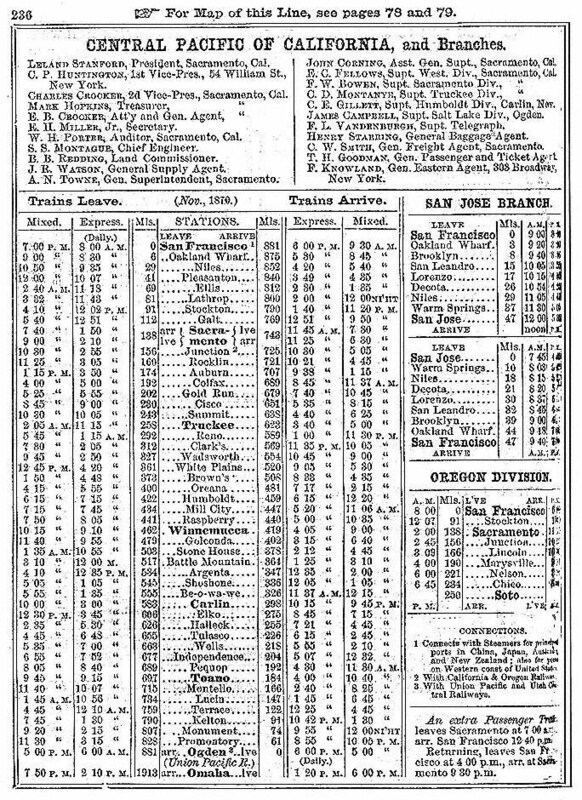 "Travelers' Official Railway Guide" UPRR and CPRR Schedule for April, 1868. Competition among these guides for readers was understandably fierce, and the language they used to describe themselves — and their rivals — was often overblown. Perhaps the fiercest of these rivalries was the one between Appletons' and Travelers' which finally ended when the former was acquired by the later and ceased publication in 1885. (The "Official Railway Guide" still exists today but only as a publication for the schedules of freight trains as all inter city passenger rail service is provided exclusively by Amtrak.) Although not mentioned by name, the Appleton editors clearly seemed to have Travelers' and its editor, Edward Vernon, in mind when referring to "so-called guide publishers" in the following pean to itself which appeared in their December, 1870, issue. "We would again take the opportunity of suggesting to the traveling community the benefit which they will derive by purchasing a copy of APPLETONS' NATIONAL RAILWAY GUIDE previous to commencing their journey; by so doing, they can, through the assistance of the maps and timetables, select their route. We make these suggestions in answer to communications received from travelers, complaining of their inability to procure the GUIDE, on some of the roads upon which they travel. Thousands of travelers have, within the past few years, adopted our suggestions, and have, by so doing, saved themselves much trouble, expense, and anxiety. It can be found at 11 of the principal book-stores and book and periodical agencies throughout the United States and the Dominion of Canada. We are much gratified to perceive, through the number of communications which we are almost daily receiving from nearly all sections of the country, how much the GUIDE is appreciated by the intelligent class of the community; and it shall be through no fault of its publishers or those interested in its success, if it does not ever retain the confidence so universally reposed in it. There is not an intelligent person in the United States who is not fully aware that the house of D. APPLETON & CO. have more at stake in sustaining the truly enviable reputation which the GUIDE enjoys, than have all the so-called guide publishers in the country combined; and if it should not at all times be as perfect as they and the traveler desire, it is through no fault of theirs. It is as equally well known that the circulation of the GUIDE is fifty times greater—thanks to the intelligence of the traveling community—than that of all other works of the kind, and its circulation is steadily increasing, which is owing to the fact that the people of this country know what they want, and where to obtain it. "We would also take the opportunity of thanking our correspondents for their kind expressions of regard in reference to the continued prosperity of the GUIDE, and the active interest they take in its success, and at the same time will state that there is not the least doubt of its continued prosperity, when we know that we have so very many hundreds of friends, independent of those connected with the railways of the country, all of whom appear to feel a personal interest in its continued success. There never was a railway guide started, in this or any other country, that has met with the success that APPLETONS' NATIONAL RAILWAY GUIDE has met with, or any that has the entire confidence of the intelligent class of the community, as it has; and we can not perceive how it possibly can be otherwise, as no other publishers in the country could give more attention or spend more money to make a work: of the kind more popular, more perfect, or more desirable; and its publishers take much pride in stating that their efforts have met with not only the approbation of the intelligent traveler, merchant, shipper, and tourist, but also the approbation and support of those officers connected with the railways of the country, South, West, North, and East, who have the welfare, interest, and success of the roads represented by them in view—in evidence of which it is merely necessary for us to direct the attention of our readers to the able and comprehensive manner in which their several lines are represented in the GUIDE by maps and time-tables. "We should also state that there is scarcely a day passes that we are not in reception of communications in reference to the correctness of the large general map in front of the GUIDE, congratulating us upon not only having the best railway map, but also the best and the most comprehensive and perfect railway guide at this time in existence. As we have previously stated, the map is engraved on copper, which enables us to make all necessary corrections from time to time as roads are completed, and, if either are not correct, it is through no fault of its publishers. In conclusion, we will take the opportunity of thanking our many railway friends for their promptness in furnishing us with their tables as changes were made in the time of the departure of their various trains during the past year, and we have not the least doubt, judging from the past, that they will be equally as prompt in the future." 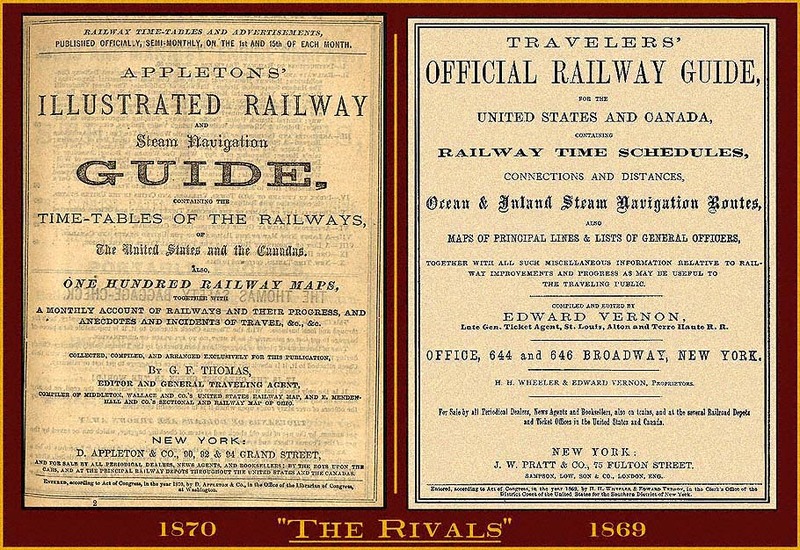 "The Rivals" – "Appletons'" vs "Travelers'"
The gauntlet for this bitter rivalry was thrown down by Edward Vernon, a former General Ticket Agent for the St. Louis, Alton and Terre Haute Railroad, who had long been unhappy with the quality and accuracy of the pervasive "Appletons' Guide" published by the large and powerful New York publishing house of D. Appleton & Co. Beginning in 1862 Vernon and other members of the National Association of General Passenger and Ticket Agents had been proposing that the Association encourage the publication of a new railway guide which would be "the only one by the authority of, and recognized by the Association." That new guide, the "Travelers' Official Railway Guide of the United States and Canada," finally appeared in June, 1868, with Vernon as both Editor and joint proprietor with H.H. Wheeler, former GTA of the Northern Missouri Railroad. In the following two editorials, which appeared on pages 1 through 4 of that first issue, Editor Vernon made it quite clear exactly what he thought of "Appletons'"—and what he planned to do about it! "The Travelers' Official Railway Guide for the United States and Canada, herewith presented to the favorable notice of our numerous railway friends and the kind consideration of an appreciative public, is designed to effect two purposes for the classes above alluded to—viz., economy for the former, and correctness and reliability for the latter. Local Time Tables of the different roads, from which the intrinsic value of any work of this character is derived, will be published free of charge, and we are confident that this fact, combined with the active co-operation of our railway associates—especially those who have charge of the passenger and ticket departments on the respective lines—advertised and represented herein, will assure us an early possession of the latest Time Tables, and thus travelers may depend upon the Guide being always correct and reliable. We are fully aware that any work of this nature is open to severe criticism, and we anticipate very great difficulty in establishing a basis of publication which, in theory and detail, may be universally acceptable. "Some may object to the arrangement of the Time Tables, and others may wish that our information were more diffuse but we shall attempt to carry out our work in good faith, trusting to time for the removal of any prejudices which may exist against our undertaking. It is needless to state that no publication of Time Schedules in a general Railway Guide can claim even a semblance of originality. Our task lies principally in the arrangement and revision of such matter (not original) as is kindly furnished to us; and in the attempt to carry out, as far as practicable, the suggestions of those who are more competent than ourselves to judge of what is requisite for the roads which they respectively manage, All suggestions made to us, either by railway officers or by the traveling public, will receive prompt attention, and that respect to which they are justly entitled, and we in return, shall deem it an especial favor if those friends who have extended to us their sympathy and endorsement will help to keep us on the right track by notifying us promptly of any and every change in time or administration which may occur. "Improvements of any character on a line which contribute to the increased comfort and convenience of the traveling public cannot find a better advertising medium than the pages of this work which, we trust, will eventually find its way into the remotest corner of this country, and become as much a household word as the transatlantic "Bradshaw." We urge this subject more forcibly from a prediction that the day is not far distant when the railways of this continent will be entirely dependent for their popularity, as through lines, upon the accommodations which they furnish to the traveling public. Special attention will also be paid to the progress of new railways, and the statistics of those already established. We shall thus be able not merely to furnish solid information which will be valuable to the general reader, but to make comparative abstracts of the earnings and operating expenditures which may be practically useful to those who manage these vast railway interests, and who are naturally desirous of having all information of this nature condensed and simplified as much as practicable. No amount of labor will be deemed excessive so as to perfect the object which we have proposed to ourselves in this undertaking; but our success is dependent upon that hearty co-operation of Superintendents and other general officers which has, with scarcely any exception, been cordially given to us, and for the continuance of which we are egotistical enough to believe that our Guide will be a guarantee. "Railways here are, comparatively speaking, in heir infancy, and the order of things has been inverted to that of older countries. Lines have been built to open up and develop territory, and the owners and projectors have trusted in many cases to the prospective earnings for the wherewithal to make their roads first-class, as far as construction and equipment were concerned. In some respect we can learn useful lessons from the transatlantic railways, and we shall, therefore, attempt to enlist into our service the experience of practical men in Europe and elsewhere with whom engineering, in all its branches, has been a life long science, and we trust that comparisons will not be deemed invidious. "Eventually we propose to insert in this Guide maps of the several States, and perhaps, to substitute them for the large map in the front part of the work, as it will be impossible to produce a clear and correct map of the whole country between the Atlantic and Pacific which would not be cumbrous and inconvenient to the traveler. With this view the arrangement of the roads in the Guide has been made to correspond, as nearly as possible, with the various States—due regard being paid, where practicable, to the immediate connection of such railways in their respective states. It is but justice, however, to ourselves to say that this first issue must not be regarded as a sample of the future. The work has been pushed through hurriedly, so as to convince our friends that we were in earnest. Time will suggest many alterations, and the engravers will have much labor in producing such maps as are requisite for a publication of this character; but no expense nor labor will be wanting to make this work a success, and one which will more than justify the anticipations of those who have so cordially sympathized with and endorsed its inception. "Such is the axiom of our contemporary, such is the assertion which the Editor of the Appleton Railway Guide attempts to palm off upon the railway community, and the public generally. Fortunately, there are some persons still living who recollect that a Guide flourished prior to that now published by the Messrs. Appleton. There was a Guide in 1856, from which this worthy Editor copied verbatim, and copied not merely what was correct, but even clerical and typographical error. That Guide had a circulation which has never been enjoyed by the vaunted Guide of the Messrs. Appleton, and had its subsequent proprietors been men of similar resources to those who publish the "only Railway Guide," it is questionable whether this last work would not have died a natural death, and been now, like many others, a relic of the past. "The old "Dinsmore Guide" was known and appreciated by thousands, its Editor was a man of fertile resources, and possessed, amongst other qualifications, the pen of a ready writer—at least, if we can form any opinion from an article which is quoted in another portion of this book, under the head of "Copyright Privileges and Guide Monopoly." Under the able and efficient superintendence of Mr. Batterman, the "American Guide," based upon the "Dinsmore Guide," and possessing all its privileges of priority, was fast attaining a large circulation, and was esteemed by all railway men of experience more correct in detail and arrangement than that Guide which boasts of being the "only Railway Guide in the country, which has the confidence of both the traveling and railway community." To the privileges of the old "Dinsmore Guide"—privileges (if any exist in a work of this character) many years antecedent to those which the Messrs. Appleton can claim—to succeed; and there will be no lack of energy or ability on our part to restore the old "Dinsmore Guide," in a new dress, and under a new name, viz, The Travelers' Official Railway Guide, to that enviable position which it once occupied amongst the periodical publications of the country. 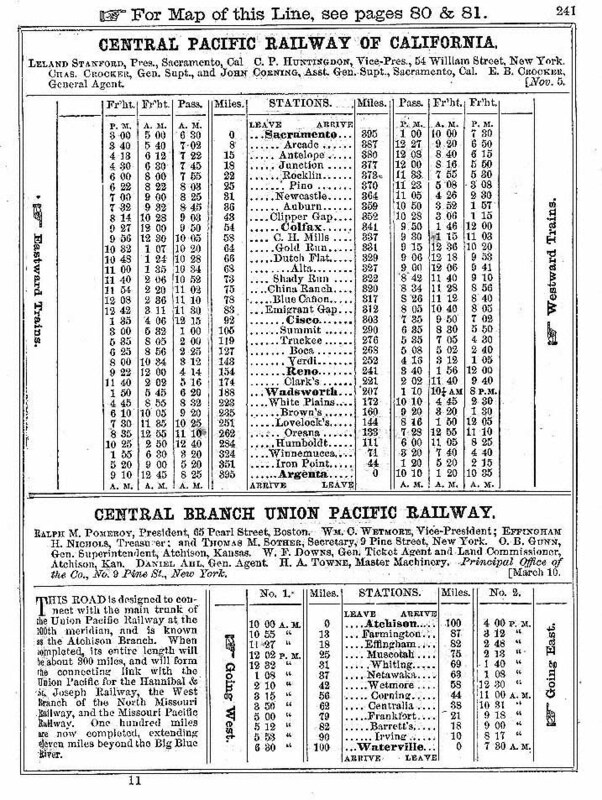 Central Pacific Railroad August 1, 1867 Schedule (below) from the March, 1868 "American Railroad Guide"
"As old railway officers, and especially connected with that department which controls the passenger business, we can almost blush at the effrontery which induces the editor of our contemporary to state that his Guide possesses the confidence of the railway community. His memory, to say the least, must be very treacherous, if he cannot call to mind several circumstances which have happened during the past two years that proved incontestably the total want of confidence which the "Appleton's Guide" possessed with those who were the best capable of judging about its merits or demerits. 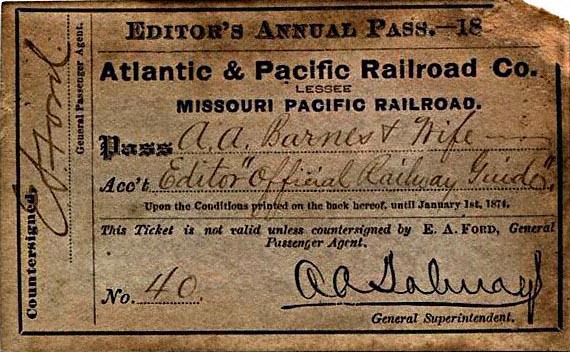 Had either he or any of the eminent firm who publish that work been present at meetings of the General Ticket and Passenger Agents' Association, held in Chicago, Cleveland, Cincinnati, New York and Memphis, as we were; had he taken part in those deliberations—wherein the project of starting a new Railway Guide, under the auspices of the General Ticket Agents' Association, was first broached—and heard the maledictions vented upon a monopoly which had been grossly abused, and whose demands were oppressive and extortionate, we think that he could scarcely have the audacity to place before railway officials such a transparent exaggeration. "Our language may appear strong, but the case warrants it; for we maintain that no man is justified in telling an untruth knowingly—no circumstances, however trying, warrant a man (even for business purposes) in perpetuating a wilful deceit. Do contracts now in our possession, signed by officers representing nearly 20,000 miles of the principal railways in the country, endorsing the Travelers' Official Railway Guide, officially, pecuniarily and by advertisement, betray a want of confidence? Does the action of the American News Company of New York, and the Western News Companies of Chicago and St. Louis, by which they advertise themselves our exclusive agents manifest a want of faith in the ultimate success of this enterprise, which, managed by railway men, must, with but few exceptions, have the cordial good-will and sympathy of our quondam associates amongst the railway fraternity? "We may not have the pecuniary means at our disposal which the Messrs. Appleton possess; individually we may not have the printing experience which might be materially useful at the present, but we occupy a better vantage ground than any which can be bought for money—we rely upon that moral and potential influence which railway officers and railway employees generally can exercise to our advantage. We are confident that they will rally as one man to the support of this Guide, when it has once made its appearance, and convinced them that we are in earnest. It is with this faith, and the firm conviction that the public generally are opposed to monopolies, and will give us a fair representation, that we launch this new Guide upon the somewhat dangerous sea of literary publications. "There may be many hidden reefs on which our work may make shipwreck, and we may be swallowed up in that maelstrom which has engulfed many a literary barque before; but we have a chart before us—the chart of experience—on which is plainly traced the course he has led our contemporary into his somewhat present UN "enviable" position, and we have a polar star to guide us—viz., the hope of justifying in this work the confidence which our friends have manifested in our ability to reach the haven of success." The completion of the Pacific Railroad was a matter of considerable moment to the nation and, of course, also to the publishers of railway and travel guides. 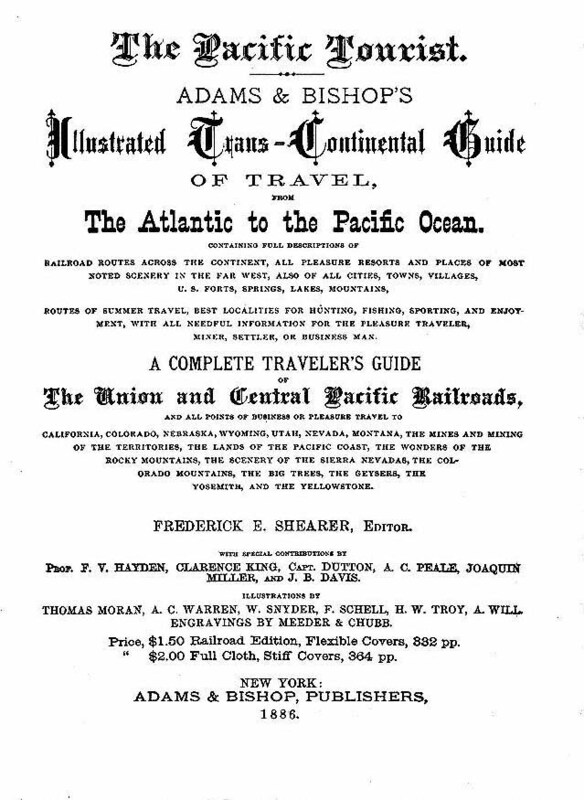 The issue of "Appletons' Railway and Steam Navigation Guide" for May, 1869 – the month the rails of the Union and Central Pacific finally joined at Promontory Summit, U.T. — featured a fine two page map of the completed Central Pacific route. 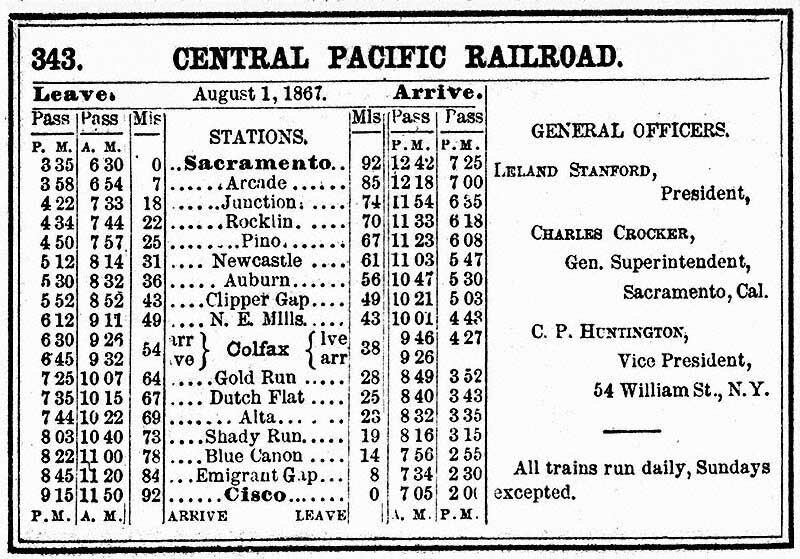 The CPRR schedule which appeared on page 241, however, was dated November 5, 1868, and showed service by three trains (one passenger, two freight) a day each way between Sacramento to Argenta, Nevada, a distance of 395 miles. 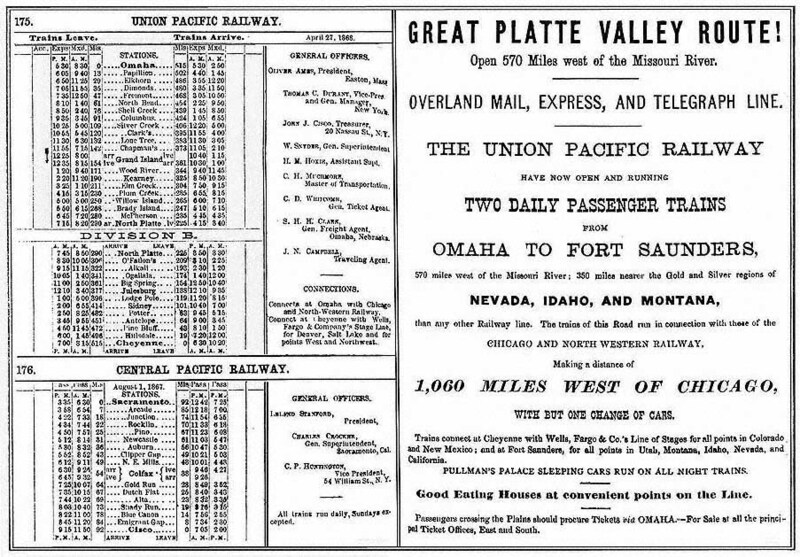 The UPRR's service was also represented by a map and a more recent schedule dated February 1, 1869, showing four trains a day each way running between Omaha and Wahsatch, U.T., a distance of 966 miles. Also included was an editorial on pages 53 and 54 entitled "Our Great National Railway" relating to the Pacific Railroad's importance not only in promoting emigration to populate the West, but perhaps more importantly to its role in the development of both domestic commerce and as a conduit for international trade between China and Europe. This was followed by the reprint of an editorial from the Council Bluffs Nonpareil entitled "Railway Policy of the Country." "The importance of a railway across the continent to the Pacific has never been denied, especially since the discovery of gold in California, and the consequent rapid settlement of the Pacific coast and the mining Territories. This great public improvement is due to private enterprise, although the Government agreed to lend the national credit, to the amount of $50,000,000, to the two operating corporations which undertook he work. These companies were the Union Pacific Railway Company, building from Omaha, on the Missouri River, west; and the Central Pacific Railway Company of California, building from Sacramento, east, until the two roads meet. It is expected that, by the middle of June, at most, there will be direct communication by rail between New York and San Francisco. The Union Pacific, coming from the east, is not far from Welland City, seventy miles beyond Salt Lake City, and the Central Pacific, coming from the west, is fifty miles this side of Humboldt Wells. The intervening space lies through a country somewhat diversified in character, there being level plains and some mountains. The track has yet to go across Promontory Point, when, for twenty miles, there is considerable rough ground, which, however, will offer no impediment to laying the track. It was only commenced in January, 1866, and about 3,682 miles have been completed in less than three years and a half. If these companies meet with success, we shall have, in less than twenty years, one of the wealthiest corporations the world has ever yet seen, to which the property of Trinity Church will be but a mere atom. For instance, the Government has granted to the Union Pacific Company every alternate section of land for twenty miles on each side of the road, making, in all, twenty sections, equal to 12,800 acres for each mile of the railway. For a distance of 1,100 miles, this grant, which is an absolute donation, mounts to 14,080,000 acres. The country traversed is rich in agricultural resources, and, when the wealth of this region is poured into the lap of Manhattan, who can estimate our future trade. "The distance between New York and San Francisco is as follows: New York to Omaha, 1,800 miles; Omaha to San Francisco, 1,882 miles; total, 3,682 miles. "Therefore, the cargo of 100,000 pounds of tea, valued at $75,000, could be sent in 40 days from Canton to London, across this continent, at a freight of 4 1/2 cents per pound, which would amount to $3,500. Now, suppose this cargo had been sent by clipper-ship, at 2 cents per pound, which would amount to $2,000, and take 160 days in performing the journey, and during all that long time no advices could be sent. Now, if we take the difference in time, we may see how freights will be nearly equalized. "The difference, therefore, would only amount to $425; but, all four cargoes could be landed in the same space of time by rail that one is by clipper-ship, a merchant would not require so much bank accommodation, and insurance would be considerably lost; so that the various charges saved would more than make up the difference between the two freights. Another grant point worthy of consideration to our merchants is the fact that California is a great fruit-growing country, and the delicious grapes, etc., which could not keep during a long sea-voyage through the tropics, will be sent fresh to New York overland. The amount of passenger business alone will be enormous, and the many thousands in the far West who have never visited this great city will avail themselves of the facilities offered by easy transportation. It was predicted by one, in 1866, who carefully considered the subject, that 50,000 per annum would soon make the journey to and from California. In 1868, facts more than justify the prediction; for about 70,000 were carried by the main lines running from New York. The overland travel both ways should bring the total to about 100,000. It is certainly within bounds to assume, that, with the cheaper and quicker transit afforded by railway, the amount of travel will be doubled, and that but a small portion will take any other route than that over the Union Pacific. Our next spring trade will feel the effects of this through line, which will not be thoroughly in operation before then; and if all the anticipations formed are realized, the changes likely to occur in our business centers will be very complete. Great impetus in the trade of perishable articles will take place, and the fruit luxuries of the Pacific and the Atlantic will exchange." Railway Policy of the Country. "The great internal policy of the United States is the settlement and improvement of her unoccupied lands. To this end, since the days of our national independence, we have sedulously encouraged foreign immigration. We have exacted from the foreigner but a short probation, before investing him with full citizenship, that he may have a role in determining the questions of interest in his newly-acquired home. We have smoothed, with governmental care, the pathway of the native emigrant to his Western farm, protected him from the wily savage, and cleared the streams by which he transports his early produce to market. Later in the history of legislation, even this original policy of the country was enlarged, and the Government "gave every man a farm." The enactment of the Homestead Law was an acknowledgment that the best interests of the country would be subserved, not by the disposition of public domain for the direct revenue resulting from its sale, but by the ultimately greater contribution to the general wealth of the State, following the cultivation of the soil, the building of towns and cities, establishment of manufactories, and other improvements, in new Territories. "Still more recently, the plan of granting lands to railway companies has paved the way for a more astonishing rapidity in the settlement of new Territories, and the settler absolutely is carried to his farm, which costs him nothing, by the swift locomotive, and finds the iron road ready made by his door, to carry the results of his labor to a profitable market. It also enables him, unlike the earlier and less fortunate settler, to command for himself and family, in their prairie home, the luxuries of the old. As a result, we see a class of people moving into our frontier communities, who, under the old system, would have been unwilling to meet the privations of a pioneer life, and schools, churches, and all the elements of refined society, appear simultaneously with the first-fruits of the husbandman. "It is this policy of land encouragement to railways, the arteries of civilization, and the veins of prosperity, which has enabled Iowa to double her population in a decade, and more than duplicate, in the same time, the value of her taxable property. It has brought, and is bringing, her remote and interior communities within a few hours' travel of profitable markets, which formerly were only reached through weary days of toil in miry roads. The impetus given to settlement and business, by the construction of land-grant roads, has had the additional effect of stimulating the construction of other competing and connecting lines, which would not have been built but for the existence of the former. "The illustrations, drawn from the experience of our own State, have their counterpart in other States and Territories. We need only refer, for instance, to the opening of the " Great American Desert," as the plains of Nebraska and Kansas were designated on the maps of our school-days, to the settlement, civilization, and commerce of the world. "It would seem, with these happy results so auspiciously crowning the policy referred to, strange that opposition to its continuance should be offered, and especially in districts heretofore so signally benefited thereby, and whose development is by no means yet fully completed. If it is urged that the transfer of such large tracts of public domain to railway companies creates a landed aristocracy, and puts the possession of the soil beyond the reach of men of moderate means, we answer that such has not yet been the experience in similar eases the companies finding their interest in the same direction as does the Government—in bringing the lands into early production, and thus furnishing the food for traffic on their lines. Under the old system, millions of acres were absorbed by "speculators," who held them out of market, to the manifest hindrance of rapid settlement, and in many instances to their own bankruptcy. The very commendable policy of retrenchment in public financial affairs—the opposite to subsidies and the like—must not be confounded with a policy of fostering, at no expense, but with positive gain to the State, the system of internal improvement which has already, even in its infancy, done so much to develop our Western wilds, and add to the community of interest to the whole nation. Though these gifts be broad as nine old States, they are better redeemed to settlement by railways, than lying waste as the hunting-grounds and war-plains of the savage. No other agency, since the introduction of steam itself, has proved so all-powerful in advancing the wealth of a nation, especially a new and growing one, as the construction of railways, and that country leads in prosperity which accords the most liberal encouragement to their extension. When once built, they become a part of the permanent wealth of a people, and in this respect afford a manifest advantage over less certain investments." By the close of 1870 the Pacific Railroad had already been open for a year-and-a-half and transcontinental rail service was fast becoming a matter of routine. The CPRR, which had acquired and completed the Western Pacific Railroad from Sacramento to San Francisco (via ferry from Oakland), could now provide direct rail service all the way to the Pacific. In addition the company also operated a branch line from San Francisco some 47 miles south to San José. The CPRR's Oregon Division to Portland was also under construction with service already opened one hundred miles north from Sacramento. Below are the schedules of these CPRR lines as they appeared in the December, 1870, issue of "Appletons' Railway and Steam Navigation Guide." This is followed by a San Francisco Bulletin article entitled "The Railways of California" which was reprinted in that issue. It relates the rapid expansion of new rail lines in that State which were being built as a consequence of the completion of the Pacific Railroad. Combined CPRR & UPRR Train Schedule, International Railway and Steam Navigation Guide, September, 1880; C.B. Chisholm & Co., Montreal, P.Q. "California is making rapid progress, all things considered, in the construction of a home railway system, connecting with and supplementing the transcontinental road. Three or four principal lines are now being built, which will form the commercial spinal cord of the Pacific coast, its northern end reaching the pine-forests, coal-beds, and wheat-fields of Puget Sound, and the southern end running through the semi-tropical portion of California—the land of the olive, citron, orange, and lemon—to the Colorado River and the door of our sister Republic of México. The southern portion of the road will form the Pacific end of the main Southern Pacific transcontinental line. Eighty miles of it—from San Francisco to Gilroy—are already in operation, while 156 miles—from this city to Junction Station, via the Central Pacific road—have long been in use. "Nearly 100 miles of the northern end of the great railway chain are now completed, and form the California and Oregon branch of the Central Pacific road. The telegraph informs us that J. H. Strowbridge, who acted as Working Superintendent of the Central Pacific road, has been placed on the California-Oregon road. He has taken with him a large force of Chinese laborers, who are to be added to the Mongolian army that is already at work on the line. The determination is to reach Tehama—123 miles from Sacramento—before the rain sets in. With Strowbridge leading, and the Central Pacific Company backing, there can be little doubt that this intention will be accomplished . The California & Oregon road runs through the entire length of the Sacramento Valley, which is the great granary of the State, and, the climate of which being much more humid than that of the south, is our most reliable seat of wheat production. "The surveyors of this road have reached a point in Shasta Valley, nearly 200 miles north of Sacramento, and not far from the Oregon boundary, toward which State both the survey and the grades are rapidly pushing. Progress is also being made for a local road in Oregon, which will be made by and connect with the California & Oregon line in progress northward. This system of railways will have a total length of 1,300 miles, of which at least 375 miles all told will be completed by the close of November. We are gratified to be in a position to state—and here is a most important fact for San Francisco—that the parties who are pushing the California & Oregon road southward are also actively preparing for immediate work on the Southern Pacific. The lately-advertised consolidation of the San José, Gilroy & Southern Pacific roads was the initiatory step in the work of progress on the latter road. There is much room for congratulation that such a great internal railway system is not only mapped out, but is actually making the most satisfactory progress at both its southern and its northern ends. "The building and completion of this railway system must bring both employment, money, and population to our State, while it will vastly enlarge the circle of land that may be profitably cultivated. All of these local roads will, of course, be feeders of, and will in time be fed by, the main Central Pacific line. The profits of the transcontinental road, on its Pacific side at least, have already surpassed the expectations of its most sanguine friends, but when the Pacific coast is supplied, as it is rapidly being, with much-needed local railways, and when its invariable western attendants—population and wealth—follow, the profits of the line across the continent will be as greatly increased as our prosperity will be stimulated and strengthened. All illustrations courtesy Bruce C. Cooper collection. "Editorial Comments" section in the 100th Anniversary Issue of The Official Guide relaying the history of the publication from June 1868 to June 1968. While originals are rare, reprints of 1868, 1870, & 1893 "Travelers' Official Guide of the Railway and Steam Navigation Lines ... " are available. Official Railway Guide, 1936 is available on a CD.